New ‘lab-on-a-chip’ systems, usually a few centimetres on a side or less, are currently in use or development for all kinds of chemical and biological applications: from testing water for pathogens to genetic sequencing. A liquid sample injected (or pulled) into the chip travels through micro-channels etched into glass, plastic, or silicon. These lead the sample through the chip to testing sites, with progress controlled by tiny, integrated, electronic or mechanical devices. All kinds of sensors have been integrated on these chips, detecting light, sound waves, electric fields, and so forth. However, it’s hard to really see what’s going on without resorting to big, old technology. What they have not been able to do is take a good, detailed picture: not without taking the entire chip, placing it under a microscope, and throwing away all that miniaturization effort. So, how to get the resolution without the bulk? Researchers at California Institute of Technology (Caltech, Pasadena, CA) decided to go for opt for an imaging approach that’s less like a camera and more like a scanner or photocopier. Instead of being an array or grid, the pixels are in a line, and each takes a long ‘slice’ of the image over time. The advantage of this approach is that they can combine small holes (the light to be detected comes out through 600nm apertures in a light-absorbing metal layer) with big detectors. The holes are placed so that, horizontally, they are in a continuous, high-resolution line. However, vertically, there are spaced widely apart: eventually, far enough to allow a detector (which will likely be several times the size of the nanohole) to be placed underneath without overlapping it’s neighbour. These big vertical gaps don’t matter, because the vertical resolution comes from the scanning of the object over the hole, and so is continuous: the lines of intensity variation that are picked up by the detector just need to be re-aligned to take account of the fact that they started in different places. Conveniently, the scanning motion itself comes for free with the controlled microfluidic movement in a lab-on-a-chip. Demetri Psaltis and Changhuei Yang, the Caltech professors leading the project, have dubbed the new technique optofluidic microscopy. They have already used it to image Caenorhabditis elegans (a tiny roundworm, about 1mm long) in sub-micron detail, and should able to do the same for other organisms: as long as they don’t squirm too much as they are scanned. The eventual goal is to have a device with an integrated light source, detectors, and possibly a wireless transmitter. Even the image processing could conceivably be done on integrated circuitry. However, to avoid having to perform expensive fabrication for a simple proof-of concept experiment, they looked around for a cheap way of providing illumination and focusing the light from the nanoholes to off-chip detectors. Ironically, they ended up looking to big, old technology to fulfill this function: they used a microscope. Note: Since this work was done, Demetri Psaltis has moved to EPFL in Switzerland. Top: The nanohole array scans the sample as it moves through the system. Figure courtesy of Caltech. 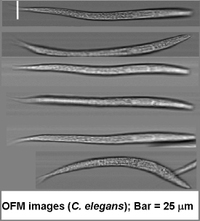 Bottom: Images from the array clearly show the detail of the specimen worm. Composite photo courtesy of Caltech.